The construction industry is known for high turnover and low morale, which leads to upheaval in teams, poor communication, skills gaps, and confusion on projects. At ABS, we have an experienced team that’s worked together for years. Why? The culture here is different. We believe that our staff comes first, and that the client is #2. We believe that if the staff is taken care of, coached, rewarded, trusted, and put in a place where they can grow, they will be equipped to take the best care of the client. The ABS team is encouraged to take responsibility and pride in every area of the company and build their skillsets to reach success individually, which allows us to achieve greatness as a business. Communication and trust between team members, leadership, and departments is what allows our team to consider their coworkers as family, and ensures that your project will be completed with the utmost of care, collaboration, and attention to every detail from design to installation and final quality control. We would be honored to part of your project, as a true partner who meets your specific needs; efficiently, and with pride. 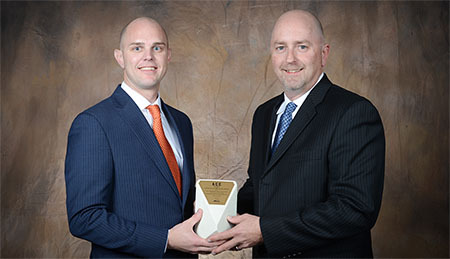 ABS was proud to be recognized with the ACE Award by the Associated General Contractors of Colorado. Anyone can do a good job if there aren’t any obstacles. ABS shines when things go wrong. Our team takes accountability and teamwork seriously, allowing us to solve problems quickly to stay on track for our clients. We don’t stop progress to determine who’s at fault, we just do what it takes to complete the project successfully, and trust that our partners will work with us when the dust settles. Our senior staff averages over 15 years’ experience in commercial construction, and lifetimes of varied construction industry knowledge, which allows them to avert crisis with confidence. By handling issues efficiently, we keep the stress off the client and keep projects on track. Not only does our team have solid skill, they are each trusted to make decisions following our “do what’s right” core values and are empowered to solve problems on site. At ABS, we believe our employees are #1 and our Clients are #2!